As the world recalls the start of the Great War, it’s the perfect time to reflect on the days when self-sacrifice and patriotism were key, and failure to live up to those lofty ideals could stigmatise a man for the rest of his life. The second book by Barnt Green author Steve Dunn is another well-written and meticulously-researched tale about a controversial figure: Rear Admiral Sir Ernest Troubridge, nicknamed “The Silver King”, who turned away from battle in the early days of the war and was branded a coward. The Coward? is a companion piece to Dunn’s first book, The Scapegoat, the tale of Admiral Kit Cradock who sacrificed his life and his ship in order to avoid sharing Troubridge’s fate. Ernest’s decision allowed the German battle cruiser Goeben to escape, bringing Turkey into the war on the German side as well as denting the prestige of the British navy. Despite being acquitted by a court-martial, he was never trusted again by the Admiralty, the press or the public. The book contains a certain amount of supposition – we can never know exactly what went through his mind on that fateful day – but this is backed up by fact, building a detailed picture of this fascinating but not always likeable character. By the end we can clearly see which side the author is on, but readers are presented with more than enough evidence to make up their own minds. We have the benefit of hindsight, but Dunn skilfully portrays the atmosphere of the time to contextualise the man and his actions. We can see that Troubridge would have felt the weight of (perhaps unfair) expectations based not only on his naval training, with its ethos of stiff upper-lipped gallantry, but also his own heroic ancestry. But the author makes much of the fact that Troubridge was not especially intelligent, pointing out that, in the navy of the time, “cleverness was regarded as suspicious”. Seemingly his single act of bravery was the rescue of a drowning signalman. While on diplomatic duties in Japan, he watched modern Japanese weapons destroy a dated Russian cruiser in the Russo-Japanese war – interestingly, Dunn suggests this as a possible reason why Troubridge eschewed battle with the supposedly superior Goeben. 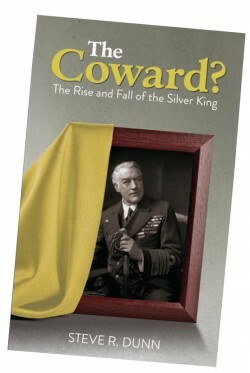 The author also draws attention to the Silver King’s difficult personal life. His beloved first wife died after delivering a stillborn fourth child; he remarried at the age of 46 to a 21-year-old who was never particularly happy with him and did not get on with his children. She eventually compounded Ernest’s public humiliation by taking a lesbian lover, a scandal at the time. Finally, Troubridge would insist for the rest of his life that he genuinely thought his orders were not to engage with a superior force, which he believed the Goeben to be. Hampered by his lack of intelligence and initiative, haunted by the memory of Japanese shellfire, irritated at Churchill’s treatment of him, and with his marriage on the rocks, the Silver King was perhaps not in the best frame of mind to make a life-and-death decision. Was he a coward? The jury’s still out on that one. Was he the right man to command a squadron at war? Maybe not – but then that was the fault of the top brass who gave him the job, prizing aristocracy above ability. The book is available from Amazon (hardback or e-book), Waterstones, Foyles and all good booksellers.